Long before the current refugee crisis, third sector organizations (TSOs) have played a pivotal role in dealing with the multifaceted challenge of migration. Researchers have analyzed this role in many ways. What is missing, however, is a comprehensive overview of how the third sector contributes to dealing with migration. To close this gap, we conduct a systematic literature review (SLR) that maps the scholarly debate on TSOs and migration. Our SLR identifies four domains of TSO migration engagement: first, the direct provision of basic services and social welfare; second, migrant-oriented capacity development; third, system-oriented advocacy; and fourth, complementary research activities. We propose a conceptual framework that highlights the contribution of TSOs with regard to individual-oriented and system-oriented services that are necessary for a successful integration of migrants. A key implication of our derived framework is to understand migration as a holistic challenge that requires contributions by different actors on different levels, thus highlighting the need for coordination and communication between the TSOs, the state and other stakeholders. Les organismes du tiers secteur (OTS) jouent un rôle essentiel dans la résolution des problèmes complexes de la migration, et ce, depuis longtemps, bien avant la crise des réfugiés. Les chercheurs ont analysé ce rôle de plusieurs façons, mais nul n’a cependant élaboré un aperçu complet de la manière dont le tiers secteur contribue à la gestion de la migration. Pour combler cette brèche, nous avons réalisé une revue systématique de la littérature pour cartographier le débat académique sur les OTS et la migration. Notre revue identifie quatre domaines d’engagement des OTS : la prestation directe de services de base et de protection sociale, le développement des capacités des migrants; la défense du système; et des activités de recherche complémentaires. Nous proposons un cadre conceptuel permettant de mettre les contributions des OTS en valeur relativement aux services axés sur les personnes et le système requis pour une intégration réussie des migrants. Une des implications clés de notre cadre de travail dérivé est la capacité de traiter la migration à titre de défi holistique auquel différents intervenants de niveaux variés doivent contribuer, exacerbant ainsi le besoin de coordonner les activités des OTS, de l’État et d’autres parties prenantes, ainsi que l’importance des communications entre ces derniers. Schon lange vor der aktuellen Flüchtlingskrise spielten Organisationen des Dritten Sektors eine wichtige Rolle im Umgang mit den vielseitigen Problemen der Migration. Forscher haben diese Rolle auf viele Art und Weise untersucht. Was allerdings fehlt, ist ein umfangreicher Überblick darüber, wie der Dritte Sektor einen Beitrag zum Umgang mit der Migration leistet. Um diese Lücke zu schließen, führen wir eine systematische Literaturrecherche durch, die die wissenschaftliche Debatte zum Thema Organisationen des Dritten Sektors und Migration ausarbeitet. Unsere Recherche stellt vier Migrationsbereiche heraus, in denen sich die Dritter-Sektor-Organisationen engagieren: erstens die unmittelbar Bereitstellung grundlegender Dienst- und Sozialleistungen, zweitens die migrantenorientierte Kapazitätsentwicklung, drittens die systemorientierte Interessenvertretung und viertens ergänzende Forschungstätigkeiten. Wir schlagen ein konzeptuelles Rahmenwerk vor, das den Beitrag der Organisationen des Dritten Sektors mit Hinblick auf personenorientierten und systemorientierten Dienstleistungen hervorhebt, die für eine erfolgreiche Integration von Migranten erforderlich sind. Eine wichtige Implikation unseres abgeleiteten Rahmenwerks ist das Verständnis der Migration als ein ganzheitliches Problem, das Beiträge von verschiedenen Akteuren auf unterschiedlichen Ebenen erfordert und so den Bedarf an der Zusammenarbeit und Kommunikation zwischen den Organisationen des Dritten Sektors, dem Staat und anderen Stakeholdern hervorhebt. Mucho antes de la actual crisis de refugiados, las organizaciones del sector terciario (TSO, por sus siglas en inglés) han desempeñado un papel esencial en el tratamiento del desafío multifacetas de la emigración. Los investigadores han analizado este papel de muchas formas. Sin embargo, lo que falta es una descripción general integral de cómo el sector terciario contribuye a tratar la emigración. Para cerrar esta brecha, realizamos una Revisión Sistemática del Material Publicado (SRL, por sus siglas en inglés) que cartografía el debate erudito sobre las TSO y la emigración. Nuestra SRL identifica cuatro campos del compromiso de las TSO con la emigración: en primer lugar, la provisión directa de servicios básicos y bienestar social; en segundo lugar, el desarrollo de capacidad orientado a los emigrantes; en tercer lugar, la defensa orientada al sistema; y en cuarto lugar, las actividades de investigación complementarias. Proponemos un marco conceptual que destaca la contribución de las TSO con respecto a los servicios orientados al individuo y orientados al sistema que son necesarios para una integración satisfactoria de los emigrantes. Una implicación clave de nuestro marco derivado es comprender la emigración como un desafío holístico que requiere contribuciones por parte de diferentes actores en diferentes niveles, resaltando de este modo la necesidad de coordinación y comunicación entre las TSO, el estado y otras partes interesadas. قبل وقت طويل من أزمة اللاجئين الحالية، لعبت منظمات القطاع الثالث ((TSOs دورا” محوريا” في التعامل مع التحدي المتعدد الأوجه للهجرة. قد حلل الباحثون هذا الدور بطرق عديدة. مع ذلك، فإن الذي ينقص هو عرض شامل لكيفية مساهمة القطاع الثالث في التعامل مع الهجرة. لإغلاق هذه الفجوة، نقوم بإجراء مراجعة منهجية للأدب (SLR) الذي يحدد النقاش العلمي حول منظمات القطاع الثالث (TSOs) والهجرة. تحدد مراجعتنا المنهجية للأدب (SLR) أربعة مجالات من منظمات القطاع الثالث ((TSOs للهجرة المشاركة: أولا”، توفير الخدمات الأساسية والرعاية الإجتماعية مباشرة؛ ثانيا”، تنمية القدرات الموجهة نحو المهاجرين؛ ثالثا”، الدعوة الموجهة نحو النظام؛ و رابعا”، أنشطة البحوث التكميلية. نقترح إطار مفاهيمي يسلط الضوء على مساهمة منظمات القطاع الثالث((TSOs فيما يتعلق بالخدمات الموجهة نحو الأفراد والموجهة نحو النظام والتي تعتبر ضرورية لنجاح إدماج المهاجرين. مفتاح تأثير إطار عملنا المستمد هو فهم الهجرة بإعتبارها تحدي شامل يتطلب مساهمات من جهات فاعلة مختلفة على مختلف المستويات، مما يسلط الضوء على الحاجة إلى التنسيق والإتصال بين منظمات القطاع الثالث((TSOs ، الدولة، وأصحاب المصلحة الآخرين. We sincerely thank the three anonymous reviewers for their constructive and valuable comments on an earlier version of this paper, which were of great help in revising the manuscript. Our thanks goes to Prof. Dr. Clemens Werkmeister (Professorship Business Administration Wilhelm Löhe University of Applied Sciences) for his valuable remarks on a draft of this paper. Additionally, we thank Dr. Dimitar Zvezdov, Roya Akhavan and Peter Wehnert for their peer feedback. Michael Garkisch, Jens Heidingsfelder and Markus Beckmann declare that they have no conflict of interest. Bidet, E. (2002). Explaining the third sector in South Korea. 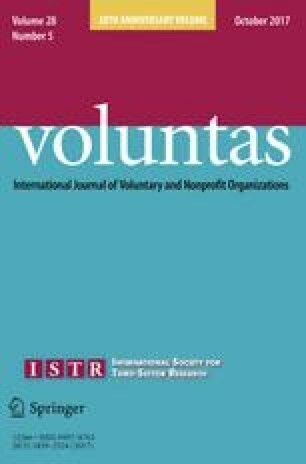 VOLUNTAS: International Journal of Voluntary and Nonprofit Organizations, 13(2), 131–147. http://resolver.scholarsportal.info/resolve/09578765/v13i0002/131_ettsisk&form=pdf&file=file.pdf. European Commission. (2015). Forced displacement—refugees and internally displaced people (IDPs). Facts and figures. http://ec.europa.eu/echo/files/aid/countries/factsheets/thematic/refugees_en.pdf. Eurostat. (2016). Almost 90,000 unaccompanied minors among asylum seekers registered in the EU in 2015. Pressrelease (vol. 87). http://ec.europa.eu/eurostat/documents/2995521/7244677/3-02052016-AP-EN.pdf/19cfd8d1-330b-4080-8ff3-72ac7b7b67f6. *Macakova, L. (2013). Selected problems of integration of foreigners in the Czech Republic. Equilibrium: Quarterly Journal of Economics and Economic Policy, 8(1), 109–124. http://economic-policy.pl/index.php/archive%5Cnhttp://search.ebscohost.com/login.aspx?direct=true&db=ecn&AN=1463100&site=ehost-live&scope=site. *Matikainen, J. (2003). The Finnish red cross in refugee settlement: Developing the integration timeline as a tool for integration in the kotopolku project. Journal of International Migration and Integration, 4(2), 273–295. http://www.springerlink.com/index/75327461MM880303.pdf. *Newman, A. (2010). Improving reach: Promoting engagement by building bridges between refugee women and the voluntary sector. Diversity in Health & Care, 7(2), 139–147. http://search.ebscohost.com/login.aspx?direct=true&db=cin20&AN=2010708161&site=ehost-live. Pittaway, L., Thorpe, R., Holt, R., & Macpherson, A. (2005). Using knowledge within small and medium‐sized firms: A systematic review of the evidence. In Lancaster University Management School Working Paper. http://onlinelibrary.wiley.com/doi/10.1111/j.1468-2370.2005.00116.x/full. UNHCR. (2010). Convention and protocol relating to the status of refugees. In UNHCR (Ed. ), Text. Geneva, Switzerland: UNHCR. http://www.unhcr.org/3b66c2aa10. UNHCR. (2015). UNHCR Mid-Year Trends 2015. http://www.unhcr.de/no_cache/service/zahlen-und-statistiken.html?cid=12025&did=10690&sechash=2dd66ba3.